Here is our selection of some of the latest promotional codes, discount codes and special offers that are available to online shoppers in Ireland. We will keep this updated regularly so check back for new discounts. Updated Sept 20th 2018. 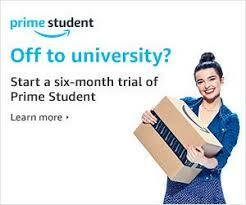 Third Level students in Ireland can now get a 6 months FREE trial of Amazon Prime. You can join on the Amazon Prime Student sign up page . At first glance , it looks like it might just be for UK students – but the free trial is definitely available to students who are studying in the Republic of Ireland . Amazon Prime now includes FREE 2 day delivery to Ireland on all Prime Eligible items (and there are millions of them . )No minimum order value applies. Free next day delivery to the UK is also included. Amazon Deals of the day can sometimes be as much as 90% off – they are updated several times each day and sometimes only last for a few hours. Strawberry Net is a US based site selling discounted fragrances and beauty products. New customers get 15% off your first order. Currys – See this weeks best deals – with some items reduced by as 60% . Good offers on appliances and computing .